NAYAGARH, India, Apr 30 2015 (IPS) - Kama Pradhan, a 35-year-old tribal woman, her eyes intent on the glowing screen of a hand-held GPS device, moves quickly between the trees. Ahead of her, a group of men hastens to clear away the brambles from stone pillars that stand at scattered intervals throughout this dense forest in the Nayagarh district of India’s eastern Odisha state. The heavy stone markers, laid down by the British 150 years ago, demarcate the outer perimeter of an area claimed by the Raj as a state-owned forest reserve, ignoring at the time the presence of millions of forest dwellers, who had lived off this land for centuries. Pradhan is a member of the 27-household Gunduribadi tribal village, working with her fellow residents to map the boundaries of this 200-hectare forest that the community claims as their customary land. It will take days of scrambling through hilly terrain with government-issued maps and rudimentary GPS systems to find all the markers and determine the exact extent of the woodland area, but Pradhan is determined. “No one can cheat us of even one metre of our mother, the forest. She has given us life and we have given our lives for her,” the indigenous woman tells IPS, her voice shaking with emotion. Unfolding out of sight and out of mind of India’s policy-making nucleus in the capital, New Delhi, this quiet drama – involving the 275 million people who reside in or on the fringes of the country’s bountiful forests – could be the defining struggle of the century. 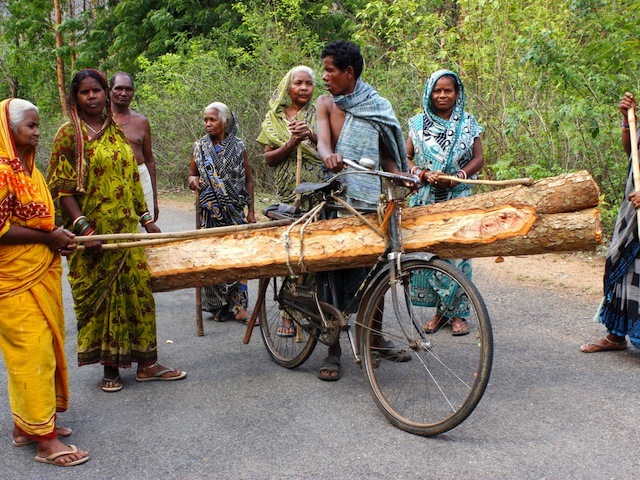 At the forefront of the movement are tribal communities in states like Odisha who are determined to make full use of a 2012 amendment to India’s Forest Rights Act (FRA) to claim titles to their land, on which they can carve out a simple life, and a sustainable future for their children. One of the most empowering provisions of the amended FRA gave forest dwellers and tribal communities the right to own, manage and sell non-timber forest products (NTFP), which some 100 million landless people in India depend on for income, medicine and housing. Women have emerged as the natural leaders of efforts to implement these legal amendments, as they have traditionally managed forestlands, sustainably sourcing food, fuel and fodder for the landless poor, as well as gathering farm-fencing materials, medicinal plants and wood to build their thatched-roof homes. Under the leadership of women like Pradhan, 850 villages in the Nayagarh district of Odisha state are collectively managing 100,000 hectares of forest land, with the result that 53 percent of the district’s land mass now has forest cover. This is more than double India’s national average of 21 percent forest cover. Overall, 15,000 villages in India, primarily in the eastern states, protect around two million hectares of forests. According to the latest Forest Survey of India, the country’s forest cover increased by 5,871 square km between 2010 and 2012, bringing total forest cover to 697,898 sq km (about 69 million hectares). Still, research indicates than every single day, an average of 135 hectares of forestland are handed over to development projects like mining and power generation. Tribal communities in Odisha are no strangers to large-scale development projects that guzzle land. Forty years of illegal logging across the state’s heartland forest belt, coupled with a major commercial timber trade in teak, sal and bamboo, left the hilltops bald and barren. Streams that had once irrigated small plots of farmland began to run dry, while groundwater sources gradually disappeared. Over a 40-year period, between 1965 and 2004, Odisha experienced recurring and chronic droughts, including three consecutive dry spells from 1965-1967. As a result of the heavy felling of trees for the timber trade, Nayargh suffered six droughts in a 10-year span, which shattered a network of farm- and forest-based livelihoods. Villages emptied out as nearly 50 percent of the population fled in search of alternatives. “We who stayed back had to sell our family’s brass utensils to get cash to buy rice, and so acute was the scarcity of wood that sometimes the dead were kept waiting while we went from house to house begging for logs for the funeral pyre,” recalls 70-year-old Arjun Pradhan, head of the Gunduribadi village. As the crisis escalated, Kesarpur, a village council in Nayagarh, devised a campaign that now serves as the template for community forestry in Odisha. The council allocated need-based rights to families wishing to gather wood fuel, fodder or edible produce. Anyone wishing to fell a tree for a funeral pyre or house repairs had to seek special permission. Carrying axes into the forest was prohibited. Villagers took it in turns to patrol the forest using the ‘thengapali’ system, literally translated as ‘stick rotation’: each night, representatives from four families would carry stout, carved sticks into the forest. At the end of their shift, the scouts placed the sticks on their neighbours’ verandahs, indicating a change of guard. The council imposed strict yet logical penalties on those who failed to comply: anyone caught stealing had to pay a cash fine corresponding to the theft; skipping a turn at patrol duty resulted in an extra night of standing guard. As the forests slowly regenerated, the villagers made additional sacrifices. Goats, considered quick-cash assets in hard times, were sold off and banned for 10 years to protect the fresh green shoots on the forest floor. Instead of cooking twice a day, families prepared both meals on a single fire to save wood. Some 20 years after this ‘pilot’ project was implemented, in early April of 2015, a hill stream gurgles past on the outskirts of Gunduribadi, irrigating small farms of ready-to-harvest lentils and vegetables. Under a shady tree, clean water simmers four feet below the ground in a newly dug well; later in the evening, elderly women will haul bucketfuls out with ease. Manas Pradhan, who heads the local forest protection committee (FPC), explains that rains bring rich forest humus into the 28 hectares of farmland managed by 27 families. This has resulted in soil so rich a single hectare produces 6,500 kg of rice without chemical boosters – three times the yield from farms around unprotected forests. “When potato was scarce and selling at an unaffordable 40 rupees (65 cents) per kg, we substituted it with pichuli, a sweet tuber available plentifully in the forests,” Janha Pradhan, a landless tribal woman, tells IPS, pointing out a small heap she harvested during her patrol the night before. “We made good money selling some in the town when potato prices skyrocketed a few months back,” she adds. In a state where the average earnings are 40 dollars per month, and hunger and malnutrition affects 32 percent of the population – with one in two children underweight – this community represents an oasis of health and sustenance in a desert of poverty. At least four wild varieties of edible leafy greens, vine-growing vegetables like spine gourd and bamboo shoots, and mushrooms of all sizes are gathered seasonally. Leaves that stem bleeding, and roots that control diarrhoea, are also sustainably harvested from the forest. But the tranquility that surrounds the forest-edge community belies a conflicted past. Eighty-year-old Dami Nayak, ex-president of the forest protection committee for Kodallapalli village, tells IPS her ancestors used to grow rain-fed millet and vegetables for generations in and around these forests until the Odisha State Cashew Development Corporation set its sights on these lands over 20 years ago. Although not a traditional crop in Odisha, the state corporation set up cashew orchards on tribal communities’ hill-sloping farming land in 22 of the state’s 30 districts. When commercial operations began, landless farmers were promised an equal stake in the trade. “But when the fruits came, they not only auctioned the plantations to outsiders, but officials also told us we were stealing the cashews – not even our goats could enter the orchards to graze,” Nayak recounts. “Overnight we became illegal intruders in the forestland that we had lived in, depended on and protected for decades,” she laments. With over 4,000 trees – each generating between eight and 10 kg of raw cashew, which sells for roughly 0.85 dollars per kilo – the government was making roughly 34,000 dollars a year from the 20-hectare plantation; but none of these profits trickled back down to the community. Furthermore, the state corporation began leasing whole cashew plantations out to private bidders, who also kept the profits for themselves. 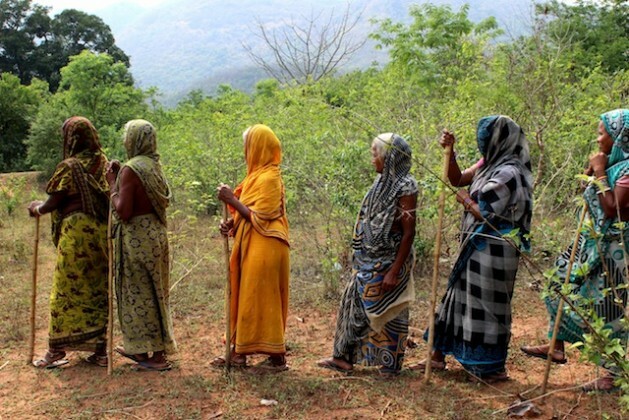 Following the amendment to the Forest Rights Act in 2012, women in the community decided to mobilise. “When the babus [officials] who had secured the auction bid arrived we did not let them enter. They called the police. Our men hid in the jungles because they would be beaten and jailed but all they could do was threaten us women,” Nayak tells IPS. “Later we nailed a board to a tree at the village entrance road warning anyone trespassing on our community forest that they would face dire legal consequences,” she adds. Once, the women even faced off against the police, refusing to back down. In the three years following this incident, not a single bidder has approached the community. Instead, the women pluck and sell the cashews to traders who come directly to their doorsteps. Although they earn only 1,660 dollars a year for 25,000 kg – about 0.60 dollars per kilo, far below the market value – they divide the proceeds among themselves and even manage to put some away into a community bank for times of illness or scarcity. “Corporations’ officials now come to negotiate. From requesting 50 percent of the profit from the cashew harvest if we allow them to auction, they have come down to requesting 10 percent of the income. 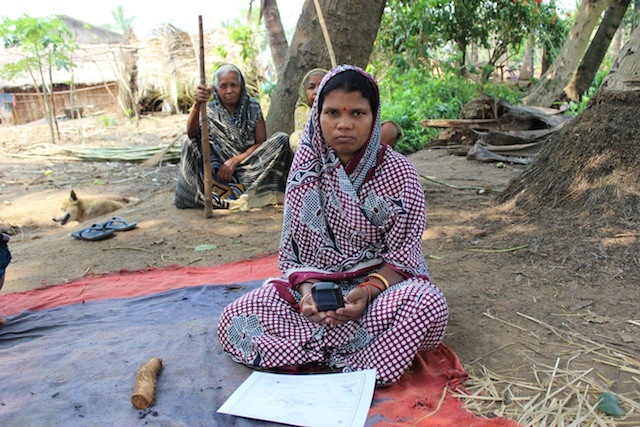 We told them they would not even get one rupee – the land is for community use,” recounts 40-year-old Pramila Majhi who heads one of the women’s protection groups that guards the cashew orchards. It was a hard-won victory, but it has given hope to scores of other villages battling unsustainable development models. Between 2000 and 2014, more than 25,000 hectares of forests in Odisha have been diverted for ‘non-forest use’, primarily for mining or other industrial activity. In a state where 75 percent of the tribal population lives below the poverty line, the loss of forests is a matter of life and death. According to the ministry of tribal affairs, the average earnings of a rural or landless family sometimes amount to nothing more than 13 dollars a month. With 41 percent of Odisha’s women suffering from low body mass and a further 62 percent suffering from anaemia, the forests provide much-needed nutrition to people living in abject poverty. Rather than ride a wave of destructive development, tribal women are charting the way to a sustainable future, along a path that begins and ends amongst the tress in the quiet of Odisha’s forests.